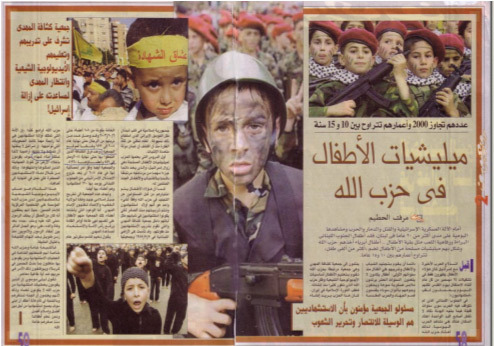 According to Roz Al-Yusuf, "Hizbullah has recruited over 2,000 innocent children aged 10-15 to form armed militias. Before the recent war with Israel, these children appeared only in the annual Jerusalem Day celebrations, and were referred to as the 'December 14 Units,' but today they are called istishhadiyun ['martyrs']..."
"The children are selected by Hizbullah recruitment [officers] based on one criterion only: They must be willing to become martyrs." "The Mahdi Scouts organization was founded in Lebanon on May 5, 1985... According to the organization's website, the number of [scouts] who had undergone training by the end of 2004 was 1,491, and the number of scout groups which had joined [the organization] was 449, with a membership of 41,960. According to the organization's most recent statistics, since 2004, 120 of its members have been ready to become martyrs. "The organization's goal is to train an exemplary generation of Muslims based on the [principle of] 'the rule of the jurisprudent' [a founding principle of the Islamic Revolution in Iran], and to prepare for the coming of the Imam Mahdi [the Shi'ite messiah]. Its members, including the children, undertake to obey their commanders, to bring honor to the [Muslim] nation, and to prepare themselves for helping the Mahdi [when he comes]." "A Nation With Child-Martyrs Will Be Victorious"
According to the article, Na'im Qasim, deputy to Hizbullah Secretary-General Hassan Nasrallah, said in an interview on Radio Canada: "A nation with child-martyrs will be victorious, no matter what difficulties lie in its path. Israel cannot conquer us or violate our territories, because we have martyr sons who will purge the land of the Zionist filth... This will be done through the blood of the martyrs, until we eventually achieve our goals." Roz Al-Yusuf (Egypt), August 18, 2006.